François Francoeur was one of the main characters at the music scene in France during the middle years of the 18th century. For most of his life he was strongly involved in performances of opera, and, as such, one of the key figures in the conflict, known as the Querelle des Bouffons, a heated debate between the supporters of traditional French opera and the promoters of the Italian style. Francoeur was the son of a musician: his father played bass violin and was a member of the élite 24 Violons du Roi. François entered the opera orchestra as well, in 1710, when he was just 12. Here he met François Rebel who was one year his senior. Because of their young age they were called ‘the little violins’. They went on to life-long cooperation and produced many operas. Until today it has been impossible to discern between their respective contributions to their collective pieces for the theatre. Francoeur’s activities in the field of opera could well be one of the reasons that his output in the realm of chamber music has received little attention. It is telling that the article on Francoeur in New Grove almost completely ignores this part of his oeuvre. On ArkivMusic one can hardly find discs which include any of his chamber music works. That said, chamber music undoubtedly takes a minor place in his oeuvre. Only two collections of sonatas are known. In 1720 he published a set of ten sonatas for violin and basso continuo. This was followed ten years later by the 2e livre, comprising twelve sonatas for the same scoring (six of them have been recorded by the Ensemble Daimonion; Passacaille, 2016). The present production includes the complete first set. The presence of ten sonatas is quite unusual: at the time printed editions of instrumental pieces usually consisted of six or twelve pieces. The oeuvre of Jean-Marie Leclair, the most famous French violist of his time, is telling: ten sets of sonatas or concertos comprising six or twelve items. The comparison between Francoeur and Leclair also makes sense in regard to their style of composing; both included Italian and French elements in their compositions. The presence of the Italian style does not surprise one: the violin was considered a typically Italian instrument, and in France it was not taken seriously until around 1700, when the Italian style manifested itself in the work of French composers such as Elisabeth Jacquet de la Guerre, François Couperin and Jean-Féry Rebel. Francoeur’s sonatas comprise four or five movements, and are quite different in their structure. Most of them open with an adagio; these movements are among the most Italian, and show much of the pathos which is so typical of Italian violin music. Three sonatas open with an allemande; two of them have the addition ‘adagio’. The third is an allegro, and this indicates that Francoeur does not follow the order of the Corellian sonata. The first movements are followed by series of dances, which all have French titles: allemande, courante, sarabande, gigue, gavotte. Several sonatas include a rondeau, which is often the most virtuosic movement. A special case is the rondeau en muzette which closes the Sonata No. 3 in B flat. Here Francoeur links up with French tradition, in which the musette usually refers to the countryside. The most Italian and most brilliant piece of the set is the Sonata No. 7 in d minor. Here Francoeur frequently uses double stopping, whereas in the other sonatas this technique is applied very sparingly. It includes two rondeaus; one of them closes the sonata and is both virtuosic and playful. Many collections of sonatas in the baroque era end with a very virtuosic piece, for instance a set of increasingly brilliant variations. Corelli’s sonatas op. 5 are a good example. Here Francoeur does the same: in the presto that closes the Sonata No. 10 in G he once again turns to the technique of double stopping, which dominates the entire movement. The recording of this set of sonatas is of great importance. They were printed three years before Leclair published his first set of sonatas. Francoeur’s pieces are just as technically challenging as Leclair’s, and also show strong Italian influences. If Francoeur had not become involved in music for the stage, he might well have become Leclair’s equal in his role in the development of instrumental music in France. Lovers of baroque violin music should consider themselves fortunate that they can add another set of fine sonatas to their collection. Kreeta-Maria Kentala can only be congratulated on her interpretations, which are technically impressive, and which make a lasting impression. 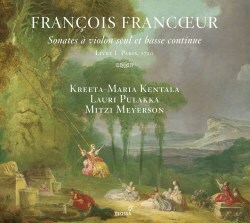 All the qualities of Francoeur’s sonatas are convincingly conveyed here, with the help of Lauri Pulakka and Mitzi Meyerson. This appears to be a winning combination once again, and they have used their skills to grant Francoeur his rightful place in the picture of French 18th-century music. This production fully deserves the label Recording of the Month.